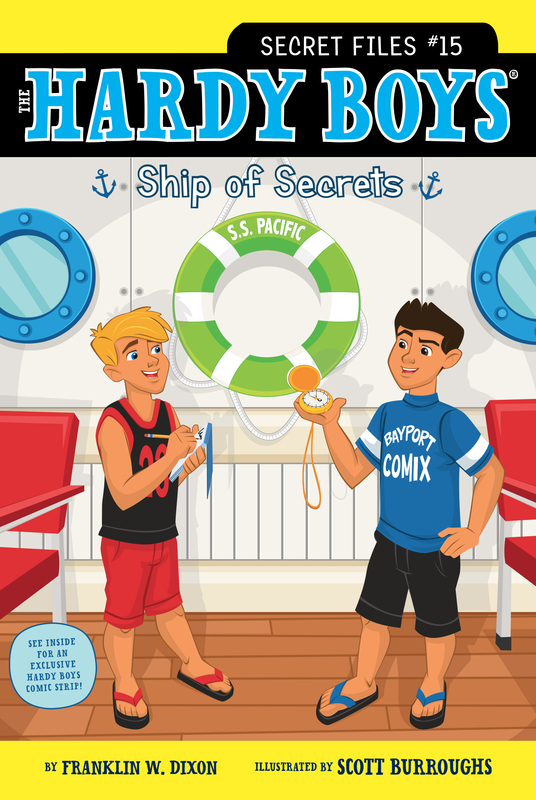 Frank and Joe solve a mystery on the high seas in this Hardy Brothers Secret Files adventure. It’s finally summer vacation, and the Hardy family is headed on a cruise to the Caribbean. As they board the ship with their parents, Frank and Joe can’t believe all the fun that’s in store for them. There are three-story slides, playgrounds, ball pits, four pools, and an arcade. There are concerts and magic shows at night, while jugglers and clowns wander the deck during the day. In addition to all of the fun, the Hardys discover that former pop idol and lead singer of the Lightening Bolts, Izzy, is now performing on the ship. That night, as the family eats dinner, they hear a commotion at the other end of the massive dining room. Someone has stolen a very valuable and sentimental pocket watch from Izzy. Can Joe and Frank solve the case before the ship docks in the first harbor? Or will time run out on this case? There it is! I can see it!” Joe yelled. He climbed over his older brother, Frank, who was sitting next to him in the taxi cab. He pointed out the window. Now that they’d turned into the harbor area, they could see the twelve-story cruise ship in the dock ahead of them. “Ship of Wonders, here we come!” Frank cried. “What are the wonders again?” Joe asked. They had gone over this three times before the trip, but he kept forgetting. “The Great Pyramid of Giza, the Great Wall of China, the Taj Mahal, and the Roman Colosseum are a few of them,” Mr. Hardy explained. Mrs. Hardy leaned over, pointing out a few pictures from the cruise pamphlet. There was a circular building that had windows all around it. In the center was a huge pool. There were a few statues of men in armor standing near the entrance. “The gladiators!” Frank exclaimed. As the cab pulled up at the curb, he drew an invisible sword, pretending to fight his brother. He swung once, then twice. Joe pulled out his own “sword,” and the two jumped out of the cab, making clashing and clanking sounds as they fought. “Careful!” Mrs. Hardy called out as she and their dad pulled the suitcases out of the trunk. They paid the taxi driver and followed behind the boys toward the huge ship. Mrs. Hardy patted him on the back and smiled. Joe and Frank’s dad was a private detective in Bayport, their hometown. He worked long hours solving cases, sometimes robberies, other times more serious crimes. It seemed like he always had a file he was looking over or a lead he was “chasing down.” (That was his detective way of saying “following a clue.”) Frank and Joe didn’t mind how much their dad worked, because he’d taught them how to solve cases. Together they helped neighbors and friends find missing pets or property. Once they had to figure out who stole their science fair project, Mr. Roboto. As they ran toward the ship, Frank and Joe still swung their invisible swords. Anyone looking at them wouldn’t know they were brothers. Frank had dark brown hair and brown eyes, while Joe had moppy blond hair and blue eyes. Frank was an inch and a half taller than Joe. (But he was also a year older, Joe reminded people.) Joe raised his arm high in the air and was about to strike again, when he noticed a crowd at the end of the dock. “What’s going on?” he asked, pointing over Frank’s shoulder. There were three news vans on the side of the road. Several reporters huddled around an older couple and their teenage children. The man wore a red scarf even though it was nearly ninety degrees. His puff of bright white hair made it look like a rabbit was sitting on his head. The news reporters swarmed, some taking photos, others asking the man questions. One reporter asked how much it was worth, while others asked why he’d decided to auction it now. “The time felt right,” he said. He wrapped his arm around his wife as he spoke. Beside them the two teenagers looked uncomfortable in front of all the cameras. The girl looked to be several years older than Frank and Joe, with long brown hair braided down her back. The boy looked older, maybe seventeen, and kept checking his cell phone when his parents weren’t looking. “Who is that?” Frank asked, turning to his father. “I hope those cameras aren’t following him onto the boat,” Mrs. Hardy said. They pushed past with their suitcases, walking toward the ramp that led to the ship’s entrance. But Joe and Frank were caught up in the excitement. They’d never seen so many news vans in one place. Cameras flashed, and people shouted out questions. Even as Sir Reginald and his family walked off toward the ship, the reporters followed. “Is he a duke? Or a knight?” Frank asked his parents. “Maybe he’s a king!” Joe yelled. “Definitely not a king,” Mr. Hardy said, laughing. “Though he does act like one,” Mrs. Hardy added, passing the suitcases off to a steward, who promised to bring them to their room. “Can we go explore?” Frank asked as they stepped into the ship’s glass elevator. Next to some of the top buttons were little signs. One said POOL LEVEL, another GAME ROOM, and another AQUARIUM. Joe and Frank hadn’t been so excited since the first day of summer vacation. Their parents had been talking about this cruise for weeks, telling them about all the fun things there’d be to do on the ship. But when the elevator doors finally opened on the main deck, it was better than anything they could have imagined. “The Great Wall of China!” Joe yelled, racing to a giant pool in front of them. There were slides that looked like an old wall that went down into the water. There were already twenty or so people in the pool, splashing about. “Look! There’s the pyramid!” Frank cried out. There was a twenty-foot-high pyramid with a lazy river underneath it. A few boys went through a tunnel in bright blue inner tubes. Joe ran around the deck, past some of the other pools they’d seen in the brochure. Real-life gladiators walked around the ship’s deck, taking pictures with people. Frank drew his invisible sword again, but this time he pointed it at one of the men in costume. “This is going to be the best vacation ever!” he cried. Joe followed his brother’s lead, pretending to pull out his sword again. He couldn’t stop laughing as they charged forward, toward the pool.